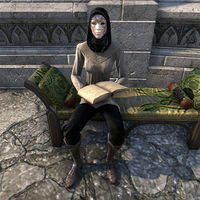 Adagio is an Altmer commoner, and member of the House of Reveries and wife and fellow performer of Allegro; who, if spoken to, will tell that it was Adagio's idea to not only join the House of Reveries but she thought up their names too. You'll find her on the west end of the terrace in front of the Manor of Masques sitting on a bench reading her book, occasionally interrupted by Silver. Adagio cannot be spoken to and has no unique dialogue.